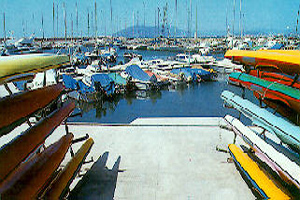 El Candado port and its club are situated in the eastern district of Malaga, an area of Malaga where the middle-high class houses predominate and where there are old fishermen districts like El Palo. -Alboran Regata, celebrated during the month of May. -Scuba diving School with a la carte courses. The members have a 10% discount and one can obtain the scuba-diving license. -Nautical School and Academy for theory and practical lessons. The Nautical Club has 280 El Club nautico cuenta con 280 berths, workshops, bar and restaurant with a sailing and windsurfing school for children and adults. It also has a paddle and tennis school for children and adults.